You may be interested in how I got USB cable drivers working under Ubuntu Linux. While working on my Intership in summer 2009, I was introduced to the world of FPGAs. I knew nothing about them at all, and there was nobody in the university to ask during the summer holiday period. I was on my own. I knew that these devices were very powerful once mastered, but I really didn’t have much of a clue. The device presented to me was the Xilinx Virtex-5 XtremeDSP Development Platform. I had no idea to begin. I started looking through Xilinx tutorials and guides, but all were way over my head. 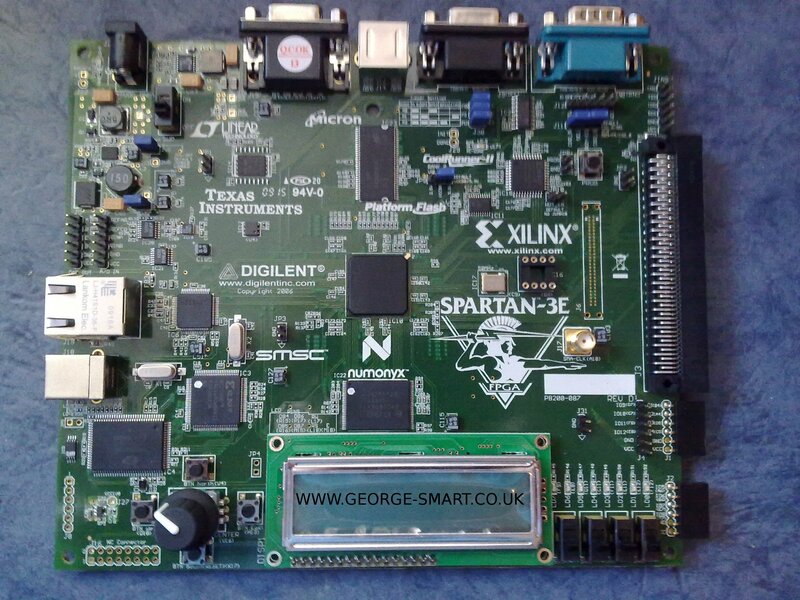 I wanted to get into this sort of technology and liked the ideas and benefits, and so I decided to purchase a Xilinx Spartan-3E Starter Kit which I brought from Digilent, Inc. They shipped the device very quickly. The image below is picture of the starter board. I had a lot of trouble getting this board to do even the simplest of things. Even just recreating an AND gate for some reason took me the best part of 2 weeks. Looking back now, I have no idea why. I spent much of my time battling the Xilinx ISE software. My most fundamental problem was getting the Xilinx JTAG programmer (on board) to work under Linux (Mint, A Ubuntu derivative). I am writing a page on this, which can be found here: Getting the Xilinx JTAG programmer to work under Linux. The biggest help thus far on the Xilinx ISE suite, and generally getting started was a series of Videos by Anthony Burch at http://www.burched.com/. He sells a set of 19 videos starting from software installation to much more complex designs and concepts. They are defiantly worth the £10.40 I paid.